So a few weeks ago I mentioned in a post that I was really struggling to get up early and run before work. I’d set my alarm then hit snooze. Then hit snooze again. And again…and again…until it was time for me really to get up and shower to go to work. A lot of people commented that being accountable to another person was a key motivator in getting them out of bed, and while I don’t have anyone to meet for a morning run, Kellie graciously offered her “accountability by text” services which I took her up on! So until last Thursday morning at 5:45am, I’m not quite sure I fully appreciated the lack of street lights where I live now! When I lived on Long Island, I regularly got up and headed out to run before the sun was up, but I lived on a well lit street, right off the main road through town which had even more street lights and a full (safe!) sidewalk. I really never thought about needing a headlamp or reflective clothing there. …I’ve gotten used to our night time group runs in the dark, but there’s something about going out alone (even with a headlamp and vest!) that still freaks me out! And you know what freaks me out the most?? Not getting hit by a car, or crossing paths with “bad people” – it’s the damn turkeys! And aside from turkeys, I’m scared of hurting myself. Honestly, I’ve fallen flat on my face running more than I care to admit (like during THIS race), so imagine how I’d fare in the dark!? Seriously, I’m just asking for a broken leg. @dnardi710 I use a head lamp and try to stick to roads were there is a sidewalk or a wide shoulder. And I wear a reflective vest. Colleen from Being Your Change also said she always checks in with someone else at home to let them know what time to expect her back and opts for audio books over music when running in the dark so she can hear surrounding noises better which are both GREAT tips! So, I have a Kellie wake up call scheduled for this Thursday morning again and we’re going to give it another shot! Here’s to hoping if I mind my own business the turkeys will too! Do you use any of these “running in the dark” tips? Are you a morning or night runner? Great post! I’m an early morning runner, and I wasn’t quite prepared for the sudden darkness that Fall brought, so (like an idiot) I had a couple of weeks of running with no reflective gear. Now I have a head lamp and an arm band that is both reflective and a flashing light. I think the vest is a good idea, but I am more concerned with nocturnal animals than cars on the routes that I run. I agree, I am totally more concerned about the animals in the wooded areas by me, I know I’m probably over thinking it, but I’m sort of freaked out that they’re like in the woods watching me run by! The wild animals also concern me more than other things. We have coyotes in the area, and I know they’re afraid of humans, but you never know. I can’t believe a girl in your run club had to mace a turkey! Um, yes, she seriously maced a turkey!! She said when she saw it she froze and then it froze and when she started to run again it began chasing her so she turned around and maced it! For all we know it could have thought they were just having a friendly race, but she didn’t wait to find out! I take my dog and wear a BRIGHT shirt – I’m not a head lamp owner yet but soon. I never thought about the animal thing before now, but you’re spot on with the turkey thing. Forget the dark, I need tips for not letting fear of the unknown wild animals keep me off the road! Haha, very true…maybe this post really is more about the creatures lurking in the dark rather than the dark itself! I’m not a fan of running alone in the dark, but early morning in my own neighborhood for a just a few miles before the sun comes up is okay. I do it only when I have to. Beware those wild turkeys. They are so mean. Ugh, I know – the turkeys are so mean and scary looking! I’m straight up scared of the dark, so I don’t typically run in the dark by myself (too many horror movies growing up, I guess!). That being said, I’ve been meaning to invest in some gear anyway, because I really should be getting out there. Thanks for the tips! Yeah, the reflective stuff is good for even when it’s just starting to get dark out, can’t hurt to be wearing some! Ha, can’t wait to see what’s next! I live out in the country, so while the roads are quiet, I don’t feel comfortable running in the dark. Town is only a couple miles, so I could drive in, but haven’t yet. This time of the year I usually switch to late afternoon runs. It is scary running in the dark, but I do it every morning. I really need to get a light. I’m lucky that I haven’t fallen yet – my friends aren’t so lucky. Ha! True story! Oh my gosh in the dark and not fall flat on your face?! I used to be able to in my old neighborhood since it was fairly well lit, but where I am now there’s no way! I run at night, but almost never in the morning. In the dark, my running routes are really limited (I avoid trails) and mostly run in well lit areas that have an adequate amount of foot traffic. I’ve been known to do 8-10 mile runs running around a single city block that was about 4/10 of a mile. 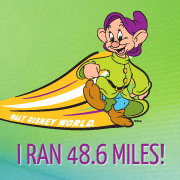 Oh my goodness, have you really done long runs on less than a half mile loop?! That’s crazy! I was new to DC and I didn’t know where else to go on a weeknight so… yes. It was really, really, really boring. Oh. my. goodness. THANK YOU SO MUCH for sharing this video! 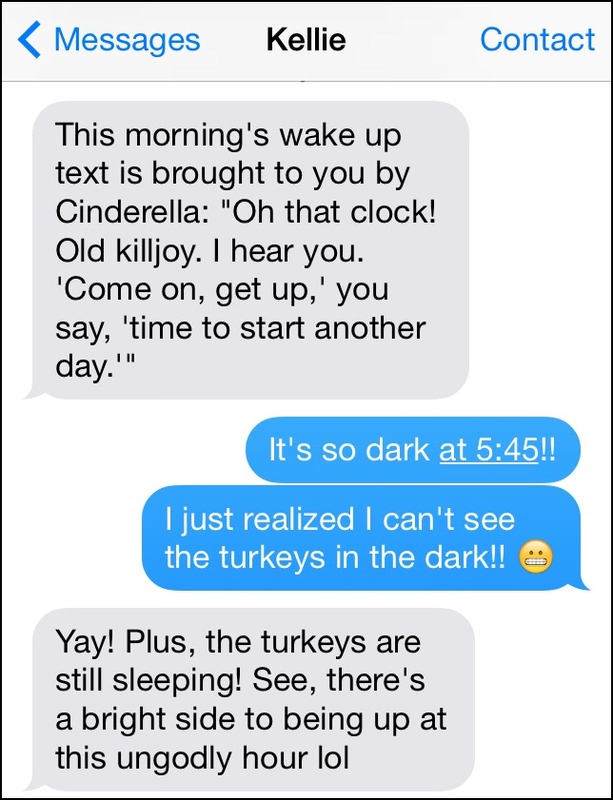 It was both hysterical and terrifying and I am now totally freaked out about a turkey knocking on my door. Where on the Cape are you from?? Well my West Virginia-born husband explained that it was a male turkey and he saw his reflection and he was “knocking” to try and peck away the male competition to his flock of lady turkeys. Sooo hopefully you don’t have any overprotective male turkeys hanging around! I’m from Sandwich… lived there my whole life, then moved to Charlotte for college/grad school…then my husband’s job just took us to very rural Virginia last year! So I also understand the lack of streetlights on the Cape…because I went from Sandwich to Charlotte (very well-lit Charlotte) back to the darkness of rural farm life. Good luck with your next wake-up call! If I run in the dark, it’s most likely to be on a winter evening. 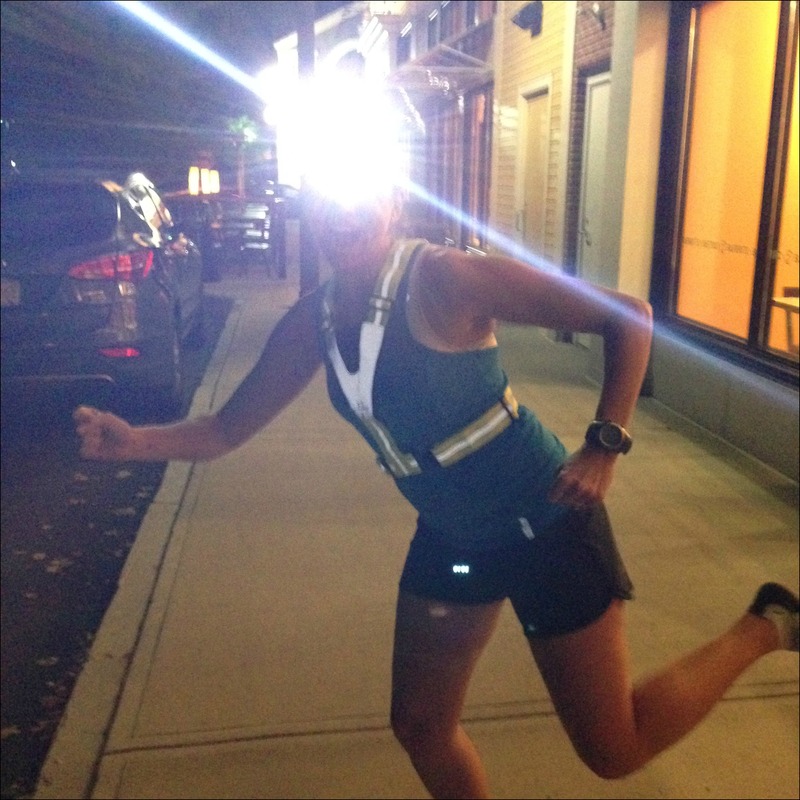 I usually rely on reflective and glow-in-the-dark gear, but if I was a regular run-in-the-dark runner, I’d def get a light and vest! I just got some new SUPER reflective tights for winter that I’m excited to take out. Love your new look! Ooo…reflective tights! 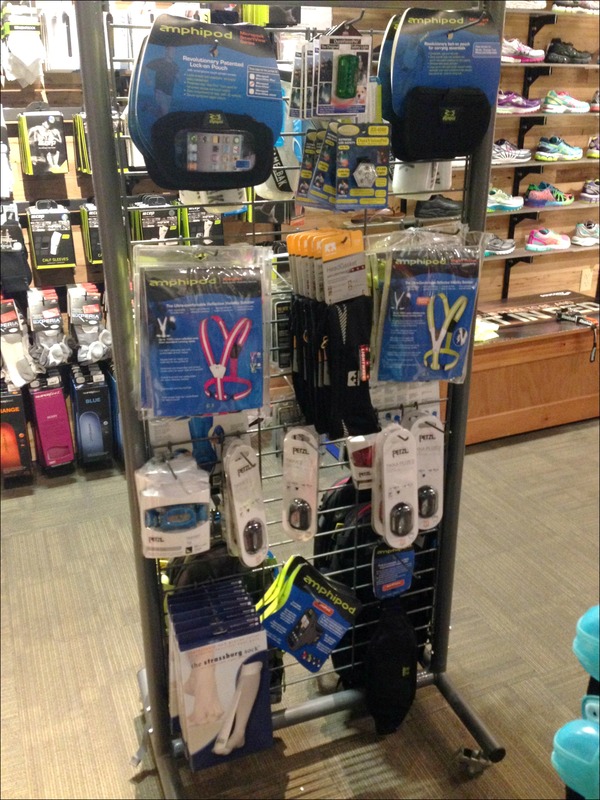 Why the heck do running companies have to make so much cool stuff?!? Those damn turkeys again! Maybe we could hit it big inventing some kind of turkey repellent. But they could make for some great speed workouts! And I’ll be happy to step in as Kellie’s backup if need be. 5:17a.m. comes pretty darn early! I keep contemplating joining a gym just for the treadmill for when it’s too dark to run, but so far I can’t justify it…we’ll have to see how the next few weeks go!